"We can be heroes: Author crafts tales that reflect women's fearlessness, strength." Girls can be heroes, too. That's the message Rockford author Phyllis K. Peterson illustrates in her new book, "The Heroic Female Spirit: A Collection of Tales." A writer, storyteller and performer, Peterson presents images to contrast "the old hero" we all know. "He carried a sword and used his fists in a violent way to achieve an heroic deed. He still does," she said. "Even the female hero in the media today uses the same type of means to achieve an end. Why would we want to encourage that type of approach to problem solving?" Peterson has traveled internationally, telling stories of women and girls and leading workshops and seminars on personal boundaries and protective behaviors for children. 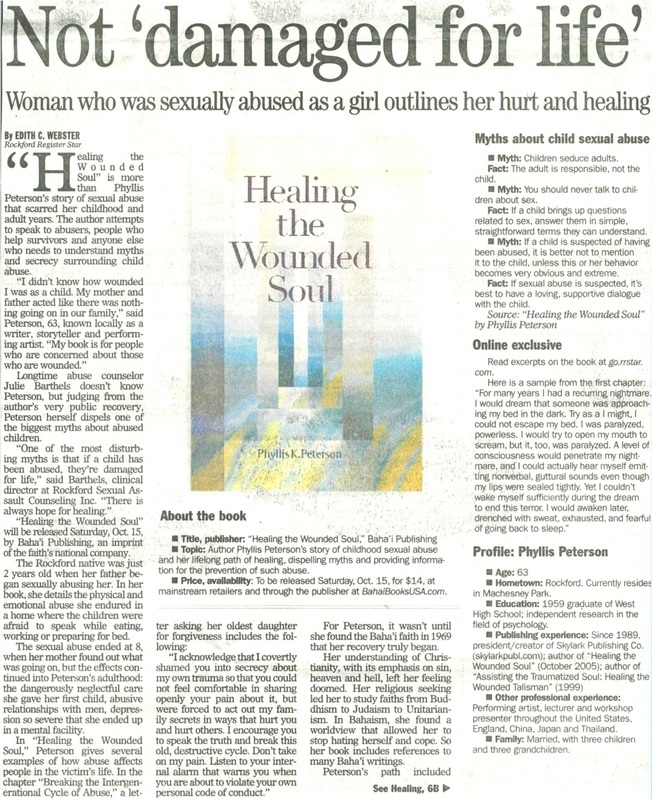 Less than a year ago, she released "Healing the Wounded Soul," a book chronicling the childhood sexual abuse she survived. Peterson is a member of the Baha'i Faith, which especially espouses principles of equality and justice. Her beliefs and moral virtues found in many religions and cultures are in her stories. In "The Heroic Female Spirit," each tale shows a young woman making a difference by acting fearlessly to improve the world around her, defying restrictive customs and creating peace. Heroic deeds can be as small as an act of kindness or selflessness, Peterson said. "We now live in a new paradigm, where girls and women can attain their highest possibilities at the same time that men and boys achieve greatness," she said. "Men don't have to lose because women reach for the stars." Transcript of 3/6/2006 Article on Phyllis Peterson's third release, "The Heroic Female Spirit: A Collection of Tales"
say, "Daddy is strong. Grandpa is strong. I'm strong. But Mommy isn't strong." Soul. "So I decided to write about women and girls as heroes." Crafted over 10 year's time, Peterson's tales feature modern heroes: They don't slay dragons; they help reshape the world. They celebrate their freedom to make choices. They recognize their strengths and self-worth. They detach from things of the world in pursuit of a higher self. And they make personal sacrifices for the sake of a higher aim. A commentary and discussion questions following each story help readers pursue these themes -- as well as Baha'i themes -- that run throughout the collection: independent investigation of truth, the oneness of humanity, equality between men and women, the elimination of all forms of prejudice and virtues such as honesty, trust, love and kindness. Peterson makes clear these beliefs and virtues apply to males as well as females. "This collection shows that anyone can be a hero. It helps males transcend the role culture has forced upon them as providers who have to meet with success at all times. It allows them to be human." to speak to abusers, people who help survivors and anyone else who needs to understand myths and secrecy surrounding child abuse. of the biggest myths about abused children. ”Healing the Wounded Soul” will be released Saturday, Oct. 15, by Baha’i Publishing, an imprint of the faith’s national company. 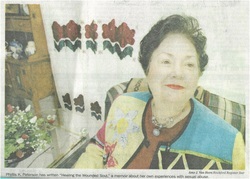 she endured in a home where the children were afraid to speak while eating, working or preparing for bed. The sexual abuse ended at 8, when her mother found out what was going on, but the effects continued into Peterson’s adulthood: the dangerously neglectful care she gave her first child, abusive relationships with men, depression so severe that she ended up in a mental facility. For Peterson, it wasn’t until she found the Baha’i faith in 1969 that her recovery truly began. Her understanding of Christianity, with its emphasis on sin, heaven and hell, left her feeling doomed. Her religious seeking led her to study faiths from Buddhism to Judaism to Unitarianism. In Bahaism, she found a worldview that allowed her to stop hating herself and cope. So her book includes references to many Baha’i writings. research, she learned enough to become a sought-after source to speak on anger management, setting boundaries, protecting children and building self-esteem for girls and women at family violence shelters, prisons, universities, community centers and workshops — both here and abroad in England, China, Japan and Thailand. in China sponsored by the United Nation’s peace advocacy organization, UNESCO (United Nations Educational, Scientific and Cultural Organization). Faith was a critical piece of Peterson’s understanding of and recovery from abuse, but religion can hurt as easily as help, said Barthels of Rockford Sexual Assault Counseling. Another danger in relying on spirituality for recovery, Barthels said, is that people of faith may mistakenly believe they are strong enough to get better on their own. prayer will solve all problems they don’t fully understand. An evangelical Christian with a master’s degree in clinical psychology, Lownsdale said he views psychology as a useful science - “when properly understood and applied.” But in his diagnosis and treatment of various problems, including sexual abuse recovery, he sees a common problem - “brokenheartedness” - and a common thread in healing: God. Infants displace fear and anxiety through excessive crying or fretful behavior. Physical ailments include vomiting, feeding problems, bowel disturbances and sleep problems. In toddlers and early childhood, look for fear of a particular person or place, regression to earlier forms of behavior, fear of being abandoned and excessive masturbation. Children ages 6 to 9 may experience nightmares, phobias concerning specific school or community activities or specific people, withdrawal from family and friends, eating disturbances and physical problems such as abdominal pain or urinary difficulties. Pre-adolescents may show signs of depression, poor school performance, use of illegal drugs or alcohol, and aggression. In adolescents and young adults, look for running away, early marriage, promiscuity, suicidal thoughts or gestures, school truancy, grief, anger/rage, pseudo-mature behavior and difficulty in forming nonabusive relationships. Don’t pressure your child to talk about the abuse. Try to return to the family’s usual activities as soon as possible. Respect your child’s privacy, and don’t tell a lot of people about the abuse. Work out your feelings with someone you trust. Don’t burden your child with your feelings. Make sure your child knows your distress is not directed at him or her. Be honest, but make sure the information you share is appropriate to the child’s age. All people are part of one human race. Men and women are equal, like two wings of a bird. Science without religion is materialism; religion without science is superstition. There is a need to establish a universal peace protected by a world commonwealth. Extreme wealth and poverty should be eliminated. Each person has a responsibility to search for truth.